"Oh, so you're not depressing." That's right! 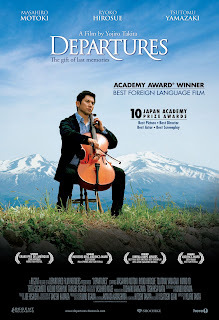 After a long time I decided to sit with my father and re-watch the 2008 award winning film by Japanese film maker Takita Yōjirō; Departures or better known as Okuribito in Japan. A true movie that plays with your feelings, Departures is simply one of those films that makes you cry and laugh both at the same time. 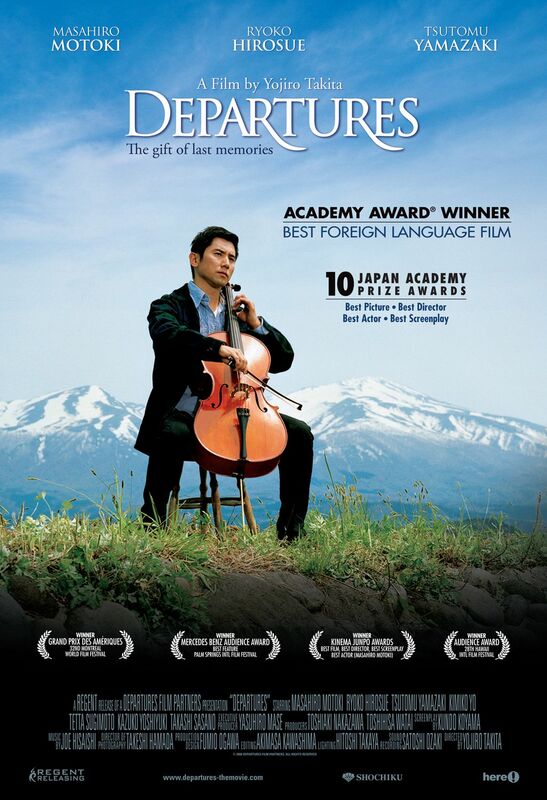 First set in Tokyo, Departures is a movie that follows the life of aspiring cellist; Daigo Kobayashi who lost his job when the orchestra he played for was disbanded. Then, he decided to return to his roots back in Sakata, Yamagata together with his wife; Mika; in order to begin a new life all together. There, Daigo first remembers of how his father left him and his mother after seemingly leaving with a waitress from their used-to-be cafe. Eventually, life got the better of them and Daigo set out to get a job and that was when he answered to an advertisement that said had the words, "Assisting with departures" as a header. Daigo had first expected a job as a tour guide and was shocked to the grounds to find that the NK Agency had turned out to be a company that dealt with the dead. The iconic "NK Agency" in Departures. NK stands for "Nokan" or "Casketing" in Japanese. Initially, Daigo found it difficult to cope with the dead when his first "case" proved to be one of the toughest (and pretty sick) cases. (No spoilers here!) 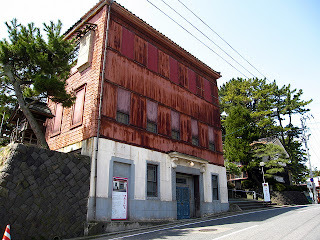 Eventually he is led back to a public bath that has been around since he was a child; a bath run by an old lady by the name of Tsuyako Yamashita; whose son was an old friend of Daigo's. 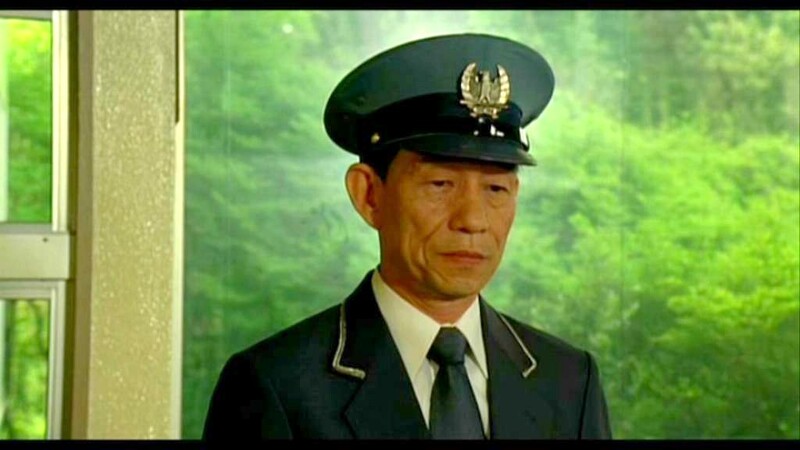 However, the movie takes a twist as soon as his old friend, Yamashita begins to look down upon Daigo's choice of career and when his own wife, Mike leaves due to the nature of his job. A few months later, Mika returns bearing good news but in return, seeks that Daigo leaves his current job. Another twist happens, rendering Yamashita and Mika to accept and respect Daigo's choice of career. End of spoilers. Now onto whatever I have to say. First and foremost, everybody dies. Even you and I. In the movie, while Daigo first found it difficult to stay onto whatever he was doing, his boss; Shoei Sasaki left him not much a choice but to continue. Tsutomu Yamazaki makes a great Shoei Sasaki performing extremely well in being cool, calm and collected at any given "task"; including ones that are nauseating, heart breaking and...odd.While his character did not have much to say, (He shouldn't be talking a lot, he deals with corpses...) the expressions he played were genuinely good and that made him quite a success. Masahiro Motoki who plays Daigo Kobayashi makes a great blur yet determined character giving me a thought that he is indeed quite a good actor. While I've never seen any other movies by him, his tears often looked real and his determination to learn from case to case; braving all difficulties even when his friend and wife leaves; convinced me to keep watching the movies, because you would have expected something grand to happen in the end. His professionalism and Sasaki's cool factor does rub off him especially in certain cases whereby you just can't help but to cry along with him. Mediocre characters such as Mika by Ryoko Hirosue, Tsuyako Yamashita by Kazuko Yoshiyuki and Yamashita (Daigo's old friend) by Tetta Sugimoto are all great additions especially in hilarious and unforgettable moments. While some may find that Yamashita was the true cause of most twists in the movie, (the non acceptance and the latter) I felt a lot more pity for him than anything especially given whatever happens later on in the movie. A special mention however, must go to Shokichi Hirata played by Takashi Sasano; the close friend or companion of Tsuyako in the movie. Shokichi, as it turns out was more than just a constant visitor of the public bath and (in my own opinion) is the one who has performed the best throughout the movie especially as his real role is revealed and the tear jerking moments just comes alive. Shokichi Hirata played by Takashi Sasano in one of the most tear jerking moments of the movie. With music from Joe Hisaishi, it's really not much of a guess work why Departures was presented with numerous awards such as "Best Foreign Language Film" in the 81st Academy Awards, "Grand Prix des Ameriques" in the 32nd Montreal World Film Festival and much more, clinching awards ranging from "Best performance by Actor" to "Best Director" and all the way back to "Best Film". A word of advice if you plan to pick up Departures: always be ready with a box of tissues. While you may use a lot more work in reading the subtitles, it's a movie guaranteed to make you cry, laugh and even get aggravated, giving you a breathtaking movie night all together. Huddle up and cry, everyone. It's natural.